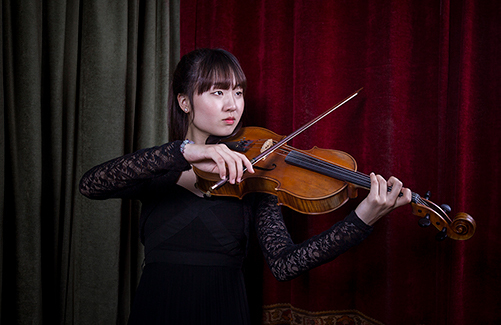 Julie Park, viola has graduated with a Bachelor of Music in Viola Performance with First Class Honours at the University of Auckland under the tutelage of Stephen Larsen. She has recently been offered the prestigious ABRSM Scholarship which covers full tuition and living cost to study her Master’s degree at the Royal Academy of Music in London, 2018. As a soloist, Julie has gained ‘First in course Award’ for solo performance in her first and second years studying at the University of Auckland. She was accepted into the 2014 Carl Flesch Akademie International Master Class in Germany to receive lessons from Professor Hartmut Rohde and was nominated to perform the J.C Bach Viola Concerto with the Baden Baden Philharmonia Orchestra. Additionally, she received the ‘Ruth-Flesch-Gedachtnispreis’ award/ scholarship selected by the conductor and judges. Being the grand winner of the 2016 Viva La Viola competition and the Auckland Philharmonia Orchestra’s Young Soloist of the year, she performed the Forsyth Viola Concerto with the Auckland Philharmonia Orchestra in the Auckland Town Hall. She was selected as one of the three finalists to compete in the 2017 University of Auckland Graduation Gala Competition; being the first ever violist to be placed in the competition. She performed with the University of Auckland Symphony Orchestra and was awarded 2nd place in conjunction with the Graduation Gala Development Prize worth $2000. Julie was a semi-finalist and recipient of the inaugural Ian Dunsmore Memorial Juror’s prize at the 2016 Gisborne International Music Competition and a semi-finalist of the Cecil Aronowitz International Viola Competition. She is also a recipient of numerous scholarships such as the Winifred Stiles Viola Prize, Spring Prize for String Player, Sagar-Vandewart Scholarship for String Players, Auckland Centennial Music Festival Scholarship, Winifred Stiles Viola Scholarship, Constance Herbert Memorial Scholarship, the 2017 Kate Edger Educational Charitable Trust Vinka Marinovich Awards in Music and the Rachel Bennett Arts Foundation Award. As a chamber musician, Julie received ‘First in course Award’ in Chamber Music Performance three years in a row (2015, 2016 and 2017) whilst her study at the University of Auckland. Julie was nominated to attend the 2nd Summit of the Pacific Alliance of Music School (PAMS) in Beijing with her chamber group ‘Mazzoli Trio’ formed by the Head of Music Allan Badley and Artistic Director of the Pettman National Junior Academy of Music Edith Salzmann to showcase and represent The University of Auckland in 2015. Mazzoli Trio were the grand winners of the 2016 Auckland Chamber Music Society Prize Competition and 2nd place winners of the SALUT International Performing Arts Competition. They are also recipients of the 2016 Carl and Alberta Rosenfeldt Prize in Chamber Music and have been selected for the Chamber Music New Zealand Encompass tour to give concerts all around New Zealand in 2018. Julie has been invited to perform at various prestigious events such as the coronation of King Tupou VI of Tonga in 2015 as a New Zealand representative as well as recorded for the Atoll Label with her ensemble; Strata Quartet. She has collaborated and performed with numerous internationally renowned artists such as Clio Gould, Jonathan Morton, Stephen De Pledge, Amalia Hall, Ramon Jaffé and Alvin Wong. Julie was part of the winning chamber group in the Auckland Chamber Music Society Prize Competition two years in a row (2015, 2016) and a finalist of the Royal Over-Seas League Competition in 2015. She has also toured nationally as part of the Chamber Music New Zealand Tour with her Quintet; Pettman Players in 2016 and in 2017, she went on an ensemble tour to the UK collaborating with Clio Gould, Stephen De Pledge, Edith Salzmann and Benedict Lim as a part of the Pettman Ensemble. As an orchestral musician, she has been Principal Viola of the Westlake Orchestras, Auckland Youth Orchestra, University of Auckland Symphony Orchestra, University of Auckland Chamber Orchestra and the NZSO National Youth Orchestra as a recipient of the 2016 Norbert Heuser Viola Award. Julie was selected to take part in the 2016 New Zealand Symphony Orchestra Fellowship Programme and was the winner of the inaugural 2016 Michael Monaghan Award from the NZSO Alex Lindsay Award Trust. She was chosen both as an Auckland Philharmonia Orchestra Orchestral Internship and the APO Young Soloist in the same year and currently working as a casual member of the New Zealand Symphony Orchestra and the Auckland Philharmonia Orchestra.